Germany and Chile faced each other for the 2nd time during the Confederations Cup in Russia after drawing 1-1 in the 2nd match of the group stage but this time, the winner was going to lift the trophy at Saint Petersburg Stadium. Germany came to this tournament without Neuer, Hummels, Kroos, Khedira, Özil, etc; Chile brought all their experienced players who have won Copa America in 2015 and Copa America Centenario in 2016. Two teams with different formations, different styles of play with quality players to produce an entertaining match. Germany played with a back 3 formed by Ginter, Mustafi and Rüdiger but without possession their shape was going to change to a 1-5-4-1 because Kimmich, on the right, and Hector, on the left, were providing support to Germany back line to stop Beausejour and Isla recurrent attacks on wide channels. 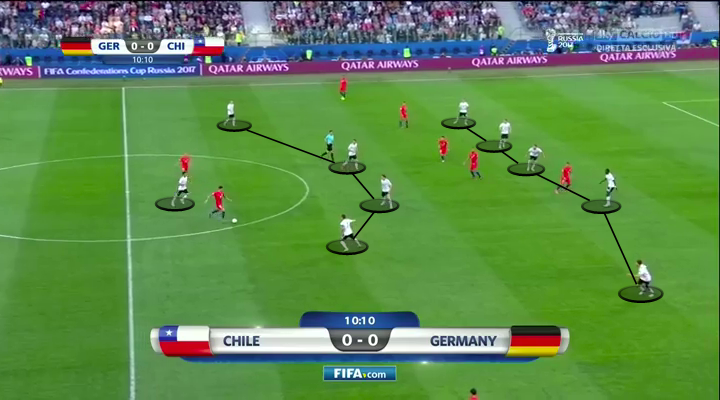 Joachim Löw’s match plan without possession was to sit deep, letting Chile play from the back without pressing on Chile’s half and avoid their attackers (Suarez and Vargas) to exploit spaces behind Germany back line. The idea behind Germany’s defensive discipline, organisation and compactness in zone 14 was to force Chileans to play down the flanks. Chile, in the other hand, played with a 1-4-4-2 formation, with a diamond in the middle of the pitch, pressing very high to force Germany to play long balls and make mistakes in their defensive third and control the possession of the ball for the majority of the match. 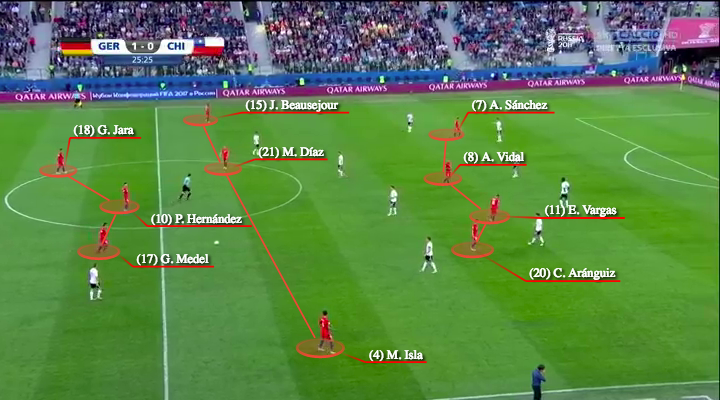 Chile’s shape when playing out from the back was going to change to a 1-3-4-3 or 1-3-3-4, where Diaz, mainly, or Hernandez were dropping deep to position between Jara and Medel. Beauseajour and Isla were pushing forward constantly to provide width to Chile’s attack. Vidal and Aranguiz joined Alexis Sanchez and Vargas up front to form a line of 4 attackers to overload Germany’s back line. In the video above, you can notice how Chile change their shape from a 1-4-4-2 to a 1-3-3-4 as they were progressing up the pitch ending with Alexis Sanchez, Vidal, Vargas and Aranguiz up front, where Marcelo Diaz provided defensive balance to Chile. During the first 20 minutes of the match, Chile delivered their game plan almost to perfection. Germany’s players were forced to play long passes because there were no spaces or time to build-up from the back, even ter Stegen was facing pressure by Chileans inside his 6 yard box. When Germans decided to play out from the back, they were going to make a lot of mistakes due to Chile’s furious pressure in numbers. Thanks to these mistakes on the defensive third and middle third of Germany pitch, Chile created their best chances during the 1st half. In the next video, you’re going to see how Chile pressed Germany to force them to play long passes and force them to make mistakes. Marcelo Diaz or Pablo Hernandez defensive duty when Chile was in possession on Germany’s half was to provide balance defensively to cope with Germans counterattacks by staying just in front of Jara and Medel who were the only two defenders staying at the back. Diaz or Hernandez were going to move to different positions to help forming a back line of 4 defenders depending where cover was needed. As you’re going to see in the next video, Diaz ended up as left back to cover Beausejour high position on the field after a “La Roja” attack. After Chile’s defence managed very well a Germany’s counterattack, and they were in control of possession again, Marcelo Diaz made a crucial mistake which saw Stindl scored the first and only goal of this Confederations Cup Final. Marcelo Diaz lack of space awareness and not listening to Jara’s commands made him give the ball away just outside Chile’s 18 yard box. Much credit to Werner and Stindl who smelled a mistake was about to happen and pressed Diaz quickly to regain possession and face Bravo in a 2v1 situation as you’re going to see in the next video. Pizzi’s men didn’t change their game plan and kept pressuring Germans during the whole match but Germany started to feel more comfortable as the match was progressing. “La Roja” created more chances without success and substitutions started to happen on the 53rd minute when Valencia came in for Marcelo Diaz. Chile’s shape didn’t change with Valencia on the pitch but Vidal adopted a deeper position. On the 81st minute, Puch and Sagal, who had a massive chance to score, came in for Vargas and Aranguiz. Chile, as I mentioned before, created many chances during the first 20 minutes but also during the second half. The majority of these chances came thanks to their relentless pressure on Löw’s men who made plenty of errors in their defensive and middle third where “La Roja” players were capable of regaining possession high on the pitch and exploiting spaces left by an outbalanced defensive line. A mix of ter Stegen good saves and a lack of quality and composure finishes by Chileans attacker, let us watch how a “perfect” plan was not enough to beat the 2016 World Cup Champions. In the next video, you will see some of the chances created by Chile which they could not finish. Chile deserved more due to their tireless intensity on the pitch, chances created and a well delivered tactical plan but in football, winners are not decided by merit. Matches are won by finding the net more than your opposition. Germany did exactly that, they created less chances but they were more effective in front of goal. We could not witness, probably, the best generation of Chilean footballers lift the Confederations Cup in Russia. After this match, Gary Lineker’s famous quote was never so certain. “Football is a simple game. Twenty-two men chase a ball for 90 minutes and at the end, the Germans always win”.